Charla Rae Denny was the perfect wife with a perfect life, content to keep the home fires burning while her husband, JB, competed as a champion bull rider. Then their son died in a tragic accident-and everything fell apart. Divorced and saddled with a hill of bills and a failing ranch, Charla must now cowboy up to put her life back together. James "JB" Denny doesn't stay where he isn't welcome. So when Charla shut him out of her grieving heart-and their home-a year ago, he took comfort where he could find it. Now after seeing beautiful Charla again, he wants it all back. 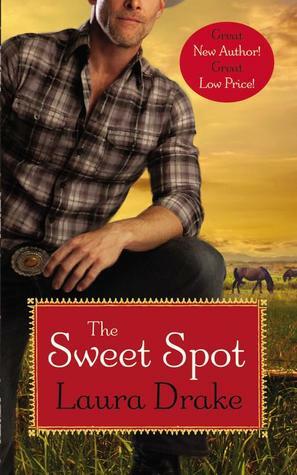 She can't work the ranch alone, and deep in his heart he knows he can be the man she needs. But after so much history and heartbreak, can JB convince Charla to take a risk and give their love a second chance? This was my first time reading Drake and I was pretty impressed. She did a wonderful job of creating an emotionally charged read that felt honest and real and very unique compared to so many romances out there. She had me ticked off, defensive, heartbroken and hopeful all in turn and completely invested in the outcome of this couple who has lost their son and each other in the aftermath of his death. What I think Drake accomplished incredibly well with The Sweet Spot was making me actually feel what her characters were going through. The struggles I had were the same ones they were battling. Did I want these two to figure it out and end up back together? Could I get over the betrayals, the addictions and infidelity and hurtful things they said? Or did I want them to just call it a day and move on? As the story went along and I got to know both Charla and JB and their individual struggles and pain I found myself wishing they would figure out a way past all their hurts and grief. That they'd find a way to forgive and move on together because they were good with each other when they could let go of the past and you could see who they were before their life crashed and spiraled. It didn't erase what they'd done in the past but I could understand (even if I didn't approve) how things happened between them. How she eased her pain with pills and cutting herself off from everyone and how he could seek comfort in someone else when he thought the marriage over. These two were both pretty much at rock bottom and it was wonderful to see them picking up the pieces and actually growing as individuals. Righting the wrongs they caused in their grief, standing on their own two feet and finding their strength and purpose. There were quite a few messy encounters but actually seeing them try really won me over to them both. "What are you up to, Jimmy?" Her lightning shift from weak to angry caught him flat-footed. "What?" She stood, hands on hips. "James Benton Denny. I washed your dirty underwear for twenty years. You think I don't know when you're up to something?" These two. Well their story was a hard one to read and shows that life can really beat the hell out of you and upend your world in the worst possible ways but it also gives you hope that true love really can overcome it all. That love may be messy and hard sometimes but it's worth fighting for. I loved watching their journey and even though it felt a bit rushed in the end I loved the real life feel of the story. That's definitely what will have me coming back to read more of Drake in the future. Have you read Drake before? What did you think? Do you like second chance romances? Do you prefer your romances light and fluffy or do you like ones that really deal with the hard bits of life too?